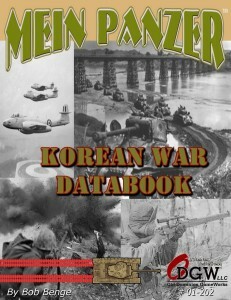 Old Dominion GameWorks has released their Korean War Data Book for their Mein Panzer gaming system. I did my senior project on the Korean War as seen from the Communist side. Interesting stuff. Announcing the next addition to the Mein Panzer Core Rules system line of miniature game supplements. The KOREAN WAR DATABOOK is now available!! This is the latest databook in a line that stretches from the WWI period now thru the Korean War. The Korean War databook will have a short history of the conflict, extensive timeline covering major events that took place during the period and information covering an astounding 19 nationalities, you will find over a thousand entries of equipment, TO&E, troop types, and special rules for the entire conflict. The meat of this book is the equipment tables, aircraft tables, ordnance tables, naval support equipment, and small arms. Well over 600 pieces of equipment have been detailed! Virtually every piece of equipment used in Korean War can be found in this supplement, from the infamous Russian T-34/85 tank to the U.S. M46 Patton tank. Troop Quality and Troop Type Tables detailing the five quality levels represented in the game. IN ADDITION, numerous specialty troops are also detailed. Tables of Equipment and Organization (TOE) for 18 of the 19 countries have at least one TO&E, while many have several. With this extensive collection, players can build upon real life TO&E for their games. Finally, the Korean War Data Book contains all the special rules you may need to fight with the equipment, or use the tactics, of the Korean War. Everything you would require to play in the Korean War, with virtually any combatant, can be found here. Mein Panzer Core Rules system is a flexible and expandable 1:1 miniature table top combined arms for recreating 20th and 21st Century combined arms ground warfare games. Designed for use with miniature scales from 6mm up to 15mm, this allows players to face off and fight historical or non-historical battles. You can play tank vs tank battles or pit infantry squads vs infantry squads. Based on the innovative Drop-In TM system, you can add in artillery, aircraft, engineering, command and moral, and much, much more to your table top game experience. A copy of the Mein Panzer Core Rules system is needed to fully utilize the contents of this publication. However, with few adjustments, the data and scenarios can be enjoyed using almost any rule system on the market today.